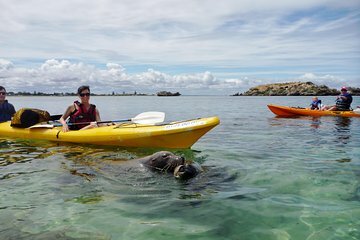 Embark on a guided full-day sea kayaking adventure from Perth and get up close to the wildlife of Western Australia. Hop on a double kayak; paddle your way around scenic Shoalwater Bay, Seal Island and Penguin Island; and look out for dolphins, Australian Sea Lions, penguins and sea birds. After a delicious picnic lunch (included) by the beachside, enjoy free time to swim, snorkel or hike around the islands before heading back to the city. Great experienced with the kayak. Scenery was superb but didn't manage to see any Seal and Sea Lion swimming in the sea. We enjoyed the picnic lunch which provided by the tour.